Hiya guys! Hope you're having a lovely weekend and enjoying some fun summer weather. Today I'm sharing swatches for the collaboration between Sassy Pants Polish and Crystal's Charity Lacquer. Every month an indie maker and Crystal get together to create polishes that will have a portion of every sale donated to a great cause. 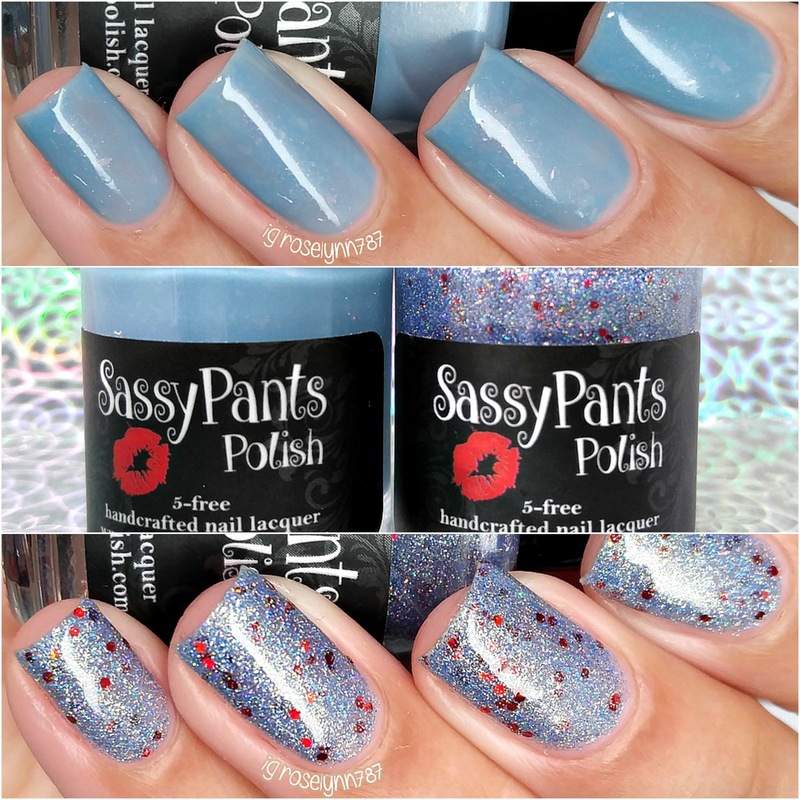 For the month of July, Crystal has joined up with Angie of Sassy Pants Polish to donate towards the Diabetes Association for diabetes research. When Angie approached about reviewing these for her I immediately jumped at the opportunity as the cause hits close to home. The Diabetes Charity Duo presented by Sassy Pants Polish and Crystal's Charity Lacquer is now available for pre-order through July 31st. These are both full size 15mL only and retail for $13.00 each. Two dollars from every polish sold will be given to Crystal to donate to the cause. Also, with the purchase of Splendad and/or Practice Safe Sugar, Angie will donate 15% of the proceeds for any additional regular priced polishes purchased at that time. As I mentioned before, this duo spoke out to me in multiple ways from the second I heard about them. When I was a teenager I briefly had the opportunity to meet my grandmother from my fathers side. To make a long story short, I never met her due to her disapproval of my parents union and my birth. Although I didn't have longer than a few hours to talk to her, I quickly discovered where a lot of my traits came from. One of which includes my hands, specifically my nails and my love of polish. A month after that visit she ended up hospitalized because of a minor cut not healing due to her diabetes, which lead to a limb amputation and, shortly after, her death. A few years prior to her death, I had attended my grandfathers funeral, whom also had diabetes and died to similar circumstances. Despite their deaths, in my mind this disease didn't fully register to me. That is until last year when it came closer to home and my heart. Both my father and mother were diagnosed with diabetes type 2, mere months apart. Initially it was a joke in our household, like 'Oh dad, no more Twinkies and Ding Dongs for you'. But slowly the reality starting hitting us as I watched them struggle with their daily glucose testing and changes to their diet. For my mother it has especially taken a toll and she has yet to manage her sugar levels. Every day I worry that something will happen to her as her sugar levels can sky rocket to 400-500. As much as we fight and get on each others nerves, I'd be so empty and lost without her. At the end of the day, I feel so useless in the fight against this silent killer. But that is why we need more research, because we need more than treatments... we need a cure! So please consider purchasing this duo and donating to the Diabetes Association. Thank you for sitting through this very personal story with me. Now let's get started on the review for the Diabetes Charity Duo. 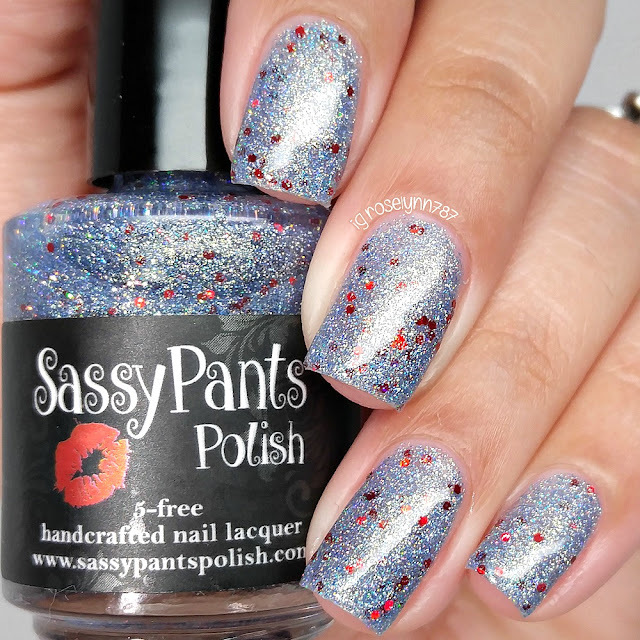 Practice Safe Sugar can be described as a scattered silver holographic micro-glitter with blue micro-flakies and medium red metallic hex glitter. From the second I saw the bottle I knew I was going to love this one, it's so sparkly and I am completely living for this color combination. 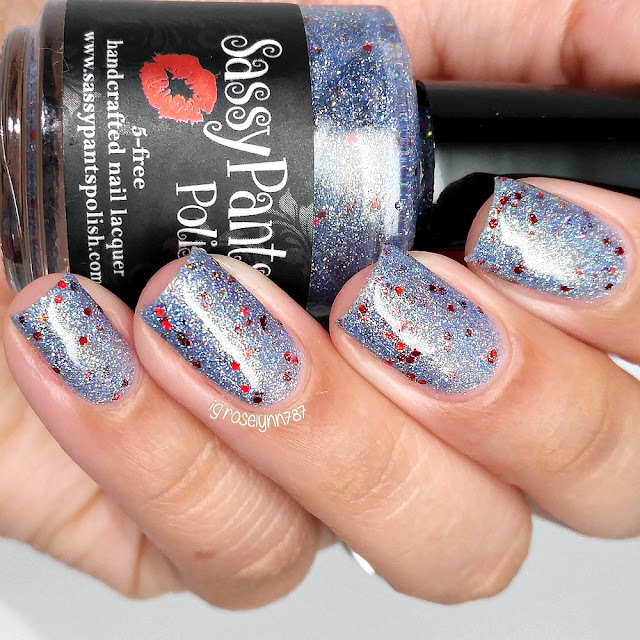 This polish can easily be worn as a topper over another shade or builds up on its own to an opaque finish. The formula has a smooth application with ample glitters per brush stroke. There is some minor dabbing needed so that the red glitters are evenly distributed on the nail. Shown here in three coats and sealed with a glossy topcoat. Splendad can be described as a steel blue crelly base with iridescent red flakes and red shimmer. Splendad is named for the sugar alternative of choice "Splenda" and is also a shout out to Crystals father-in-law and Angie’s father, who are both diabetic. The formula had good self-leveling and built up an opaque finish. The flakies had a tenacity to clump together so it was best applied with thin coats and slight dabbing. Shown here in two coats and sealed with a glossy topcoat. Overall my heart is sold on this duo, not only do they look fantastic but they are for a great cause. Both are really unique in color and glitter combination, plus they have Angie's same ol' smooth formulas. I do have to give the must-have title to Practice Safe Sugar because not only do I love the name, the polish is beyond gorgeous! As I've said, the cause is really close and personal to me, so please consider purchasing and donating to this cause. And if you read through this very long personal post today, thank you! It means more to me than words can begin to describe. 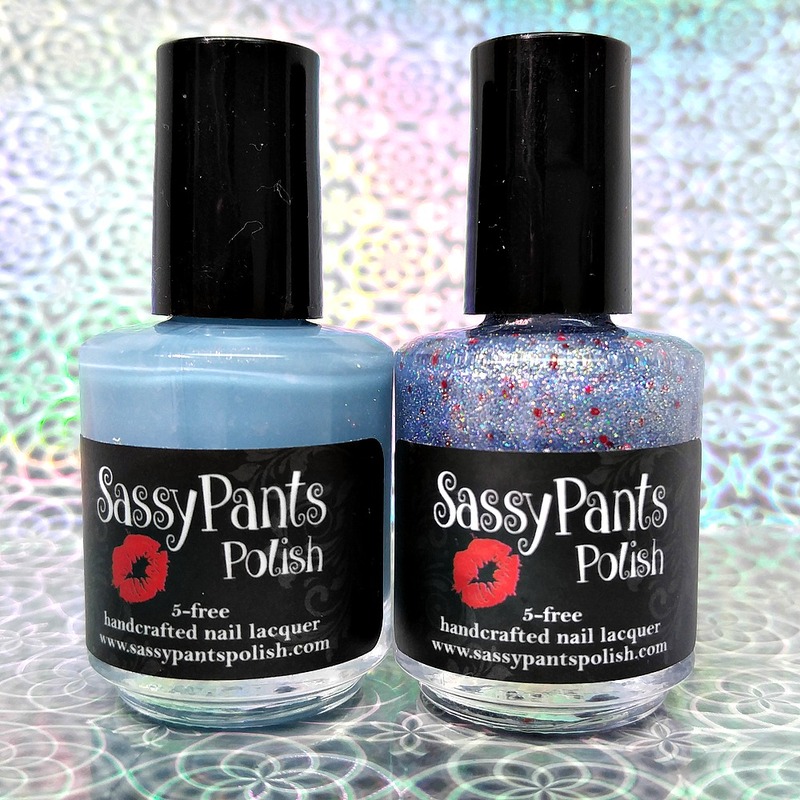 To recap, the Diabetes Charity Duo presented by Sassy Pants Polish and Crystal's Charity Lacquer is now available for pre-order through July 31st. These are both full size 15mL only and retail for $13.00 each. Two dollars from every polish sold will be given to Crystal to donate to the cause. Also, with the purchase of Splendad and/or Practice Safe Sugar, Angie will donate 15% of the proceeds for any additional regular priced polishes purchased at that time. I really love splendad! Also love that part of the proceeds go towards diabetes. I'd love to know how you shape your nails? They're gorgeous! Pinned this on my "Nailed It" and "Pay It Forward" pages. Love that they give back.